What do you do with miso? It seems like every recipe uses a teaspoon and you’re left with this big container to languish in your fridge for months. Years. I am in a unique position in that I have 3 kinds of miso languishing in my fridge right now. Three kinds! White, red and brown, in fat stubby containers that get pushed here and there, slowly accumulating a questionable amount of refrigerator debris (aka “crud”) on the lids. It’s a wonder I don’t have yellow miso too. Not sure how I missed out on that one. These containers are always in the way yet I hesitate to throw them out. Why? I think that someday I’ll find a use for them. It’s a curse. And try, I do. There’s soup, obviously, but it’s been too hot for soup. I made miso brownies a while back. They were terrible. I’ve made the ubiquitous miso black cod recipe numerous times to great success but that uses pitifully little. I read that a spoonful of miso and some parmesan cheese makes a great quick pasta sauce that I’ve been meaning to try. I even told a friend of mine she should write her next newspaper column about how to use up that miso hiding in your fridge. Despite my best, half heated attempts, this stuff didn’t seem to be going anywhere anytime soon. So I’ve redoubled my efforts to find good, interesting uses for a lot of miso. Starting with these wings. I had the great idea last month to start a “chicken wing Friday” thing. Football season had started and I do so love chicken wings. The time seemed right now that I could turn on my oven and not completely melt. 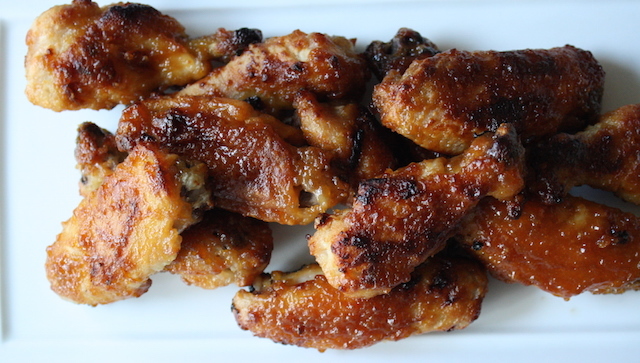 Chicken wings are easy. They’re inexpensive and often on sale. Why not roast them up and toss in some sort of miso sauce, in this case an adaption of a favorite Food52 recipe? Miso, honey and butter? How great does that sound? And the recipe uses a whole 2 Tablespoons of miso. Now we’re talking. I used my current favorite roasting method: a quick toss in a flour mixture and a high heat roast. The sauce was reduced slightly on the stove then tossed with the wings for a few more minutes of roasting to crisp up. Delicious! Salty, a little sweet, a little rich. I used a red miso, because I like it’s slightly earlier flavor here but any miso would be good. White is a little milder, brown is a touch more savory. If you have the sample problem I do with an overabundance of miso, use what you have. That’s the point. STRESS THERAPY BAKING FACTOR: BEAUTIFUL USES. As someone who has a continual stream of ingredients flowing through my house, I have to be vigilant in using them. This is not always the case so it feels good, in this instance to use a few good spoonfuls for a quick and fairly easy snack. Wish that all things went this smoothly. In the meantime, I’m still working through those tubs. Holler if you need some miso. I like the slightly stronger flavor or red miso but use what you have. That’s the point. 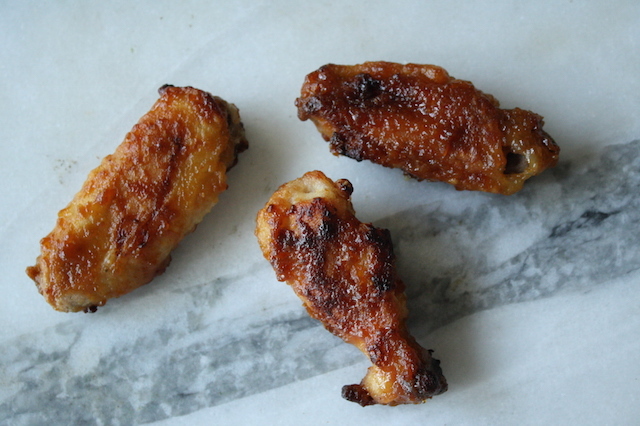 For the wings: Preheat the oven to 450°F. Line a large baking sheet with foil and spray with vegetable cooking spray. If the wings haven’t been separated into drumettes and flats, do so now by trimming off the wingtip (discard or save for stock), and giving the wing a twist to separate the joint. With a sharp knife, slice between the joint to separate the wing into 2 pieces. In a bowl, mix the flour with the salt. Add the wings and toss to coat. Dust off any excess flour mixture and spread the wings on the baking sheet in a single layer and spray the wings with vegetable cooking spray. Roast the chicken for 30 minutes, turning once or twice, until browned and crispy. For the sauce: in a small saucepan, combine the butter, honey and miso. Bring to a boil then reduce to low and simmer until thickened, about 4-5 minutes. Set aside until needed. 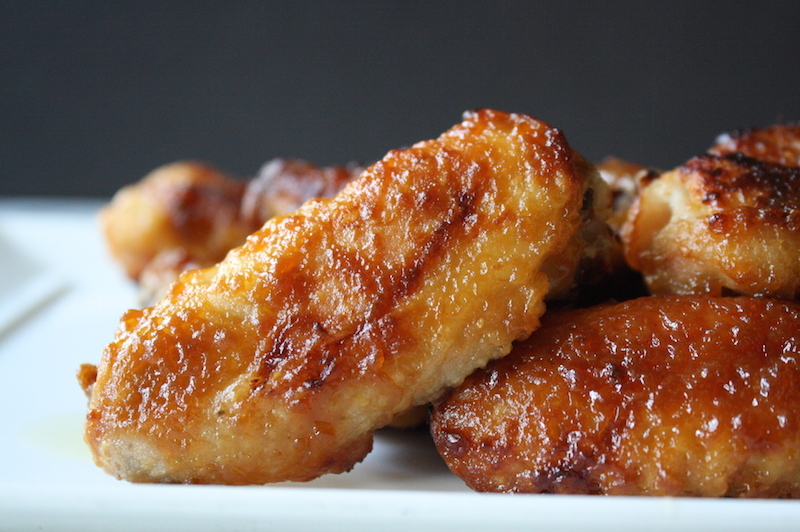 When the chicken wings are ready, place them in a medium bowl, pour over the sauce and toss to coat. Return to the wings to the sheet pan and cook again for another 4-5 minutes to crisp a bit, turning halfway through. Looks like a great dish for a Chicago Cubs party!